omg thanks for making this my favorite book ever! awesome little animation too! The first book is pretty good. Excellent idea. The second book was moody middleschool nonsense and by the third book, it's like the writer totally forgot where she was going with the idea so she went for feels instead. Good luck. If you have a digital copy, you're going to want to buy the physical copy just so you can throw it out the window. I know I did. xD. I'm would have done that, but when I read it I was in the car. And it's not worth much on eBay if you threw it out a window. I didn't really like the book. I FREAKING LOVE THIS! THANKS FOR THE AMAZING STAMP! 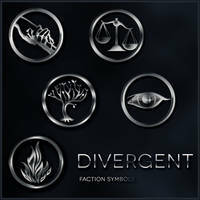 For Lovers of Divergent Stamps.